When I was a student, I took many unremarkable bus rides to and from middle school, but today’s ride was anything but ordinary. Approaching my first stop, I switched on the manual ambers. My palms were sweating as I engaged the parking brake and opened the service door. I nervously smiled and welcomed the early morning commuter. I was now officially driving my first student on the iconic yellow school bus. As a full-time teacher at a rural Kansas high school of 60 students, I became a substitute bus driver because it would allow me to supplement my family’s income, drive sports teams to and from events, and take my students on various learning experiences. I had not realized how much it would open my eyes to the daily efforts of these yellow bus road warriors and their unseen (yet vital) impact on our students’ academic success. School districts across the country are facing tightening budgets, and school transportation is such a major expense that many districts are looking for ways to cut costs (Burgoyne-Allen & Schiess, 2017). Whether that means districts are cutting routes, condensing stops, or phasing out buses from the fleet, students and their families are feeling the hurt. School transportation and the driver behind the wheel each morning and afternoon play a pivotal role in the education process by providing safe passage for students, ensuring that students are at school, and extending the positive school climate beyond the classroom. How might reductions in funding for school transportation affect families’ ability to ensure their children attend school each day? Becoming a substitute bus driver for the school district was a rigorous multi-month process. I had to pass a Department of Transportation physical, complete a defensive driving course, obtain a first aid and CPR certification, pass a series of five written tests, perform a full pre-trip inspection with no errors, and pass the driving test. No motor vehicle and driver is as stringently regulated as the school bus and its driver. A school bus must pass 33 crash-avoidance, crash-survival, and post-crash standards, five of which are unique to school buses (National Highway Traffic Safety Administration, 2014). To maintain my license, I must renew most of the above requirements every two years and attend at least nine monthly safety meetings. It is 70 times safer for students to travel by bus rather than a car. Of 40,000 deaths from traffic accidents in 2014, six were in a school bus. Each school day, 480,000 school buses transport 26 million students (over half of the U.S. student population). The issue of school transportation cannot be linked to safety alone; it is also an issue of educational equity. Although reams of research have focused on the safety of school-provided transportation, Michael Gottfried’s 2017 study is the first to investigate the academic implications of free school bus service. His study suggests a link between socioeconomic status and families’ ability to get students to school without school-provided transportation. By linking school-provided transportation and student achievement, as correlated through school attendance records, Gottfried lays the foundation to consider seriously the broad-ranging impacts that budget cuts to school-provided transportation could have on students and families. How, he leads us to ask, might reductions in funding for school transportation affect families’ ability to ensure their children attend school each day? Describing policy regarding public school transportation as a complex issue would be an understatement. 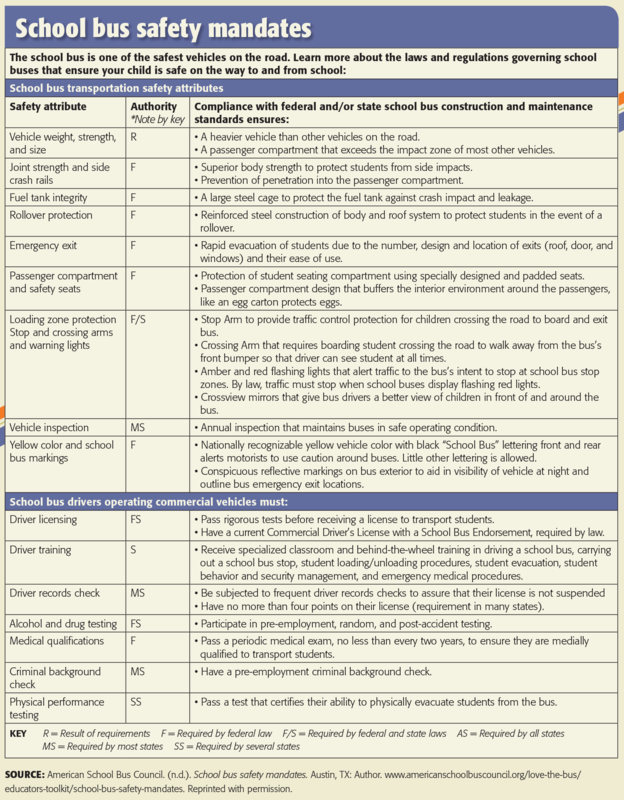 Each state has a unique collection of statutes that guide such district-level practices as the hiring of private bus fleets and the determination of the mileage radius that buses will (or will not) pick up from around a school. Further, some states have no explicit requirement for school districts to provide transportation for their students, leaving localities to set their own policies. In 2011, Indiana’s Franklin Township school district decided to end its bus service in the face of deep budget cuts. The ensuing lawsuit between parents and the school district dragged on for four years and was finally heard in the Indiana State Supreme Court, which ruled that although public schools in Indiana were required to offer a free education, they were not required to provide transportation. Several districts across the state have announced plans to end their transportation programs, but in at least one case, a funding referendum saved the program (Kardish, 2015). In districts that keep their transportation programs, an emerging and controversial trend is to charge for services (Bergal, 2015), a practice that directly affects students whose families are unable to afford the additional cost. The Indiana court ruling maintains that access to K-12 education is a right that must be protected, but the reality is that free school transportation is what secures that right for many students. There are no easy answers to the financial burdens being placed on districts by state and federal education funding cuts, but the answer cannot be to cut school transportation. School buses are more than just modes of transportation, and drivers offer more than safe passage to and from school. Research suggests that simply by greeting students at the classroom door, teachers can have positive effects on their attention throughout a lesson (Allan Allday & Pakurar, 2007). Similarly, we bus drivers are the first to greet students as they head to school, and that morning interaction can set the tone for their day. An unpleasant exchange can put students on edge before they even arrive on campus; a positive one can give them a boost. We bus drivers are the first to greet students as they head to school, and that morning interaction can set the tone for the child’s day. Many times during my brief stint as a bus driver, I have seen firsthand the power of these short interactions. I make a concerted effort to meet my student commuters with a cheerful greeting and wish them a great day when they exit. Simple yet powerful gestures such as these can go a long way for students who may not receive these affirmations at home. And students appreciate the effort. I was almost brought to tears when a group of kindergartners presented me with drawings they made of me driving their yellow school bus. Finally, bus drivers can also play an important role in schoolwide efforts to prevent and respond to bullying, fights, and other harmful behavior. 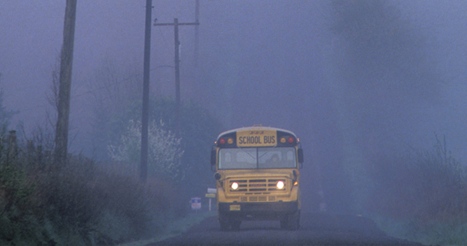 I’m aware of no real-life events like the one portrayed in Tears on the Highway — a short educational film in which one student bullies another on the bus, distracting the driver and triggering a multivehicle collision — however, the school bus does often become a prime scene for bullying, and to bullied children who have no other means of transportation, it may seem like there’s no solution other than to transfer or drop out of school. It’s hard to overstate how important it is to maintain a disciplined, positive climate on the bus, or how damaging it can be to students’ well-being to feel trapped, day after day, in a dangerous environment (Roher, 2007). In short, the importance of committed bus drivers can easily be overlooked, but those drivers ensure students’ safe passage to and from school, prevent absences, and extend a positive school climate beyond the classroom. And if districts allow driver shortages to linger, or if they cut back on funding for transportation, it won’t be long before we all come to realize just how much we rely on our bus drivers to support the larger mission of our schools. So thank you to all those who serve in this role for our students — and safe travels. Allan Allday, R. & Pakurar, K. (2007). Effects of teacher greetings on student on-task behavior. Journal of Applied Behavior Analysis, 40 (2), 317–320. Brown, T. (Director). (2008). Tears on the highway. Minneapolis, MN: Educational Media Corp.
Burgoyne-Allen, P. & Schiess, J.O. (2017). Miles to go: Bringing school transportation into the 21st century. Boston, MA: Bellwether Education Partners. Gottfried, M.A. (2017). Linking getting to school with going to school. Educational Evaluation and Policy Analysis, 39 (4), 571-592. National Highway Traffic Safety Administration. (2014). Fatality analysis reporting system, 2005 to 2013 (Final). Washington, DC: Author. Citation: Meals, A.R. (2018). Who’s really driving school outcomes? Phi Delta Kappan 99 (7), 31-34. ANTHONY R. MEALS (ameals@usd384.org; @MR_ Meals) is an agricultural instructor at USD 384 – Blue Valley in Randolph, Kan.
Great post,Am a bus driver it’s very hard job thank you for this post.